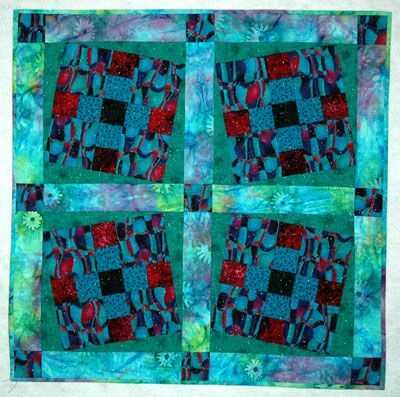 The blocks in this quilt are tilted, an easy technique that can be used with any quilt blocks. I made this quilt many years ago for a book demo. It works well in the room it's in, but I would normally choose fabrics with more contrast. The quilt measures about 31-1/2" square and was finished with simple machine quilting. Sew more blocks to make a larger quilt. If you're a new quilter, brush up on your rotary cutting skills before you cut pieces for the quilt. Use the color values suggested or alter them in any way you like. Rotary equipment, including a square ruler that measures at least 12" x 12"
Cut four 3" x selvage width strips, and then cut twelve 3" x 14-1/2" bars from the strips. This is doable if strips have a usable width of about 43". Take care when trimming selvage -- trim just as much as necessary to square up one end. Use a 1/4" seam allowance for all seams. Sew a medium-light selvage width strip lengthwise to a warm dark strip. Press the seam allowance towards the darker strip. Square up one end of the strip set and cut sixteen 2-1/2" segments. Sew a 4-1/2" dark square to each side of a segment from Step 1. Press seam allowances towards the large squares. Make a total of eight of these units. Sew a Step 1 segment to opposite sides of each 2-1/2" dark center square, placing the light portion of the unit against the square. Press seam allowances towards the center square. Make a total of four of these new units. Arrange the block into three rows, as shown above, placing the light squares in pieced units against the dark center squares. Sew the rows together, matching seams carefully. Press the seam allowances away from the center. Repeat, making a total of four blocks. Cut four of the light 2-1/2" x 16" long rectangles in half once diagonally, taking care to orient the cuts in the same direction. Cut the remaining four long rectangles in half once diagonally, but make cuts along the opposite diagonal to produce long triangles that are mirror images of the set you cut in Step 1. Choose four like triangles that are cut as shown in the upper left portion of the illustration above. Align a triangle with a block, right sides together and its 90-degree corner aligned with the top corner of a block as shown in the illustration above. The long tip of the triangle will extend past the opposite edge of the block. Sew together, beginning at the 90-degree corner. Stop sewing when you reach the block's midpoint. Working in a clockwise direction, add a second triangle to the block, matching 90-degree corners. The tail of the second triangle will extend past the wider edge of the first triangle. Press the seam allowance towards the long triangle. Moving clockwise again, add a third and fourth triangle. Press seam allowances towards the triangle after each addition. After sewing the last triangle, align the unsewn edge of the first triangle with the block again, extending it over the wide edge of the fourth triangle. Complete the seam, backstitching a few stitches over the original seam line and then continuing to the end of the triangle. Press seam allowance towards the triangle. Use the same method to sew the remaining triangles to the two remaining blocks. This set of triangles is a mirror image of the first, and e sewn to the block in a counter-clockwise direction. Place your square ruler on top of a block. Align its top and right edges 1/4" past the upper left and upper right corner "tips" of the inner block -- your goal is to square up the block, leaving a 1/4" seam allowance past those inner block tips. You'll need to twist the ruler around a bit to get the right "fit." When you feel the block is aligned, trim along the right and top edges. Turn the block around and do the same on the remaining untrimmed edges. Repeat to trim all blocks. You now have two quilt blocks with interiors that tilt one way and two that tilt in the opposite directions. Arrange the blocks in two rows, as shown above, placing vertical sashing strips between them and along outer edges. Sew sashing to blocks in each row. Press seam allowances towards the sashing. Sew horizontal sashing units together as shown, separating them with sashing squares. Press seam allowances towards the squares. Sew the quilt together, placing a horizontal sashing unit between rows and at the top and bottom of the quilt. Press seams towards sashing units. Mark the quilt top for quilting if desired. I used meander and straight-line machine quilting so did not need to mark. Make the quilt sandwich with the quilt top, batting and backing. Baste and quilt. Make binding strips and bind the quilt.